Welcome back to our blog! In part one of this short blog series, we began exploring some of the best habits to put into practice when recovering from auto injury. Changing your diet by incorporating anti-inflammatory foods like fruits and veggies packed with antioxidants, vitamins, and minerals can reduce inflammation in injured tissues in the body. Getting your fill of protein-rich foods will also help with cellular production and tissue recovery. Staying active by exercising and stretching will help stimulate the body’s natural ability to heal itself, while also releasing pain-blocking endorphins into the body to help with pain management. Keep reading below to learn a few more healthy habits to incorporate into your daily routine to aid in your auto injury treatment and recovery. While this may sound like we’re contradicting what we said in part one about staying active, getting plenty of rest during recovery is also a crucial step in the healing process. Similar to when your body is fighting an illness or infection, your body’s natural healing abilities require sleep. Like exercise releases endorphins to manage emotions and block pain, sleep releases melatonin, which stimulates your immune system so that it can help your body heal from an injury. Sleeplessness is a common side-effect associated with auto injuries, so it’s normal to experience sleepless nights and restless sleep. However, even doing low impact exercises like walking, yoga, and swimming a few times a week will help relax the body and calm the mind, which can contribute to better sleep. Part of what leads to sleeplessness is increased stress and anxiety. Being involved in an auto accident is incredibly stressful, not only when it actually happens, but also in the days, weeks, months, and sometimes years afterward. Between talking with insurance companies, setting up medical appointments, reserving a rental car, having your car repaired—the list goes on and on—your stress levels are most likely at an all-time high. But allowing stress to interfere with your life can affect your pain levels, your ability to think clearly, and can make the entire situation that much harder to manage. The best thing you can do is try to manage your stress as best you can. While we’ll most likely recommend massage therapy as part of your auto injury treatment plan for pain relief and healing, this will also help with managing stress. Try to make time for things that you enjoy doing that help calm your mind and emotions, encourage relaxation, and give you a chance to breathe and decompress. Whether you enjoy partaking in after-work happy hours to unwind, or sneak in those unhealthy sweet and/or savory snacks that taste great, but may contribute to inflammation, enjoying these special treats in moderation is key. Alcohol consumption can inhibit healthy cell production and can make the pain you feel even more intense (not to mention those awful hangovers). Additionally, drinking alcohol can interfere with sleep, and can affect your mental and emotional health. It’s best to limit alcohol consumption to a minimum during injury recovery. 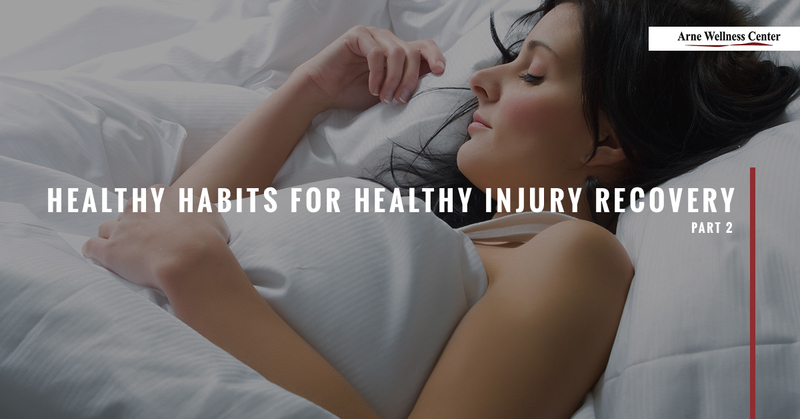 Implementing these healthy habits and limiting those not-so-healthy practices can contribute greatly to your injury recovery. If you have questions about your injury or would like to schedule a chiropractic visit with us, call Arne Wellness Center today. We provide residents in and around Littleton with personalized auto injury treatment options to fit your specific health needs and goals. Contact us today!